You can’t hold all the wine information you need in your head, but with this handy guide you can be sure it is available whenever you want it. 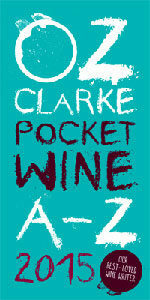 Indispensable as ever, Oz Clarke’s now classic Pocket Wine Book is meticulously updated each year. This is the 23rd edition and the book has more information, more recommendations, more facts, passion and opinion than any other comparable guide to wine. Organised in an easy-to-use A–Z format, the entries cover wines, producers, grapes and wine regions from all over the world. For optimum browsing, the guide includes a handy country by country index as well as a full producer index to help you find over 4000 of the world’s top wine producers and their wines. Detailed vintage charts, with information on which of the world’s top wines are ready for drinking in 2015, can be found on the inside front and back covers. Click here for more information and to buy this book from the Pavilion Bookstore.